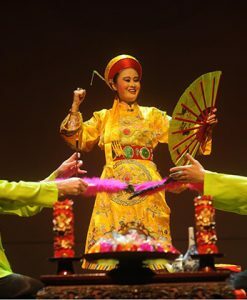 The Four Palaces Show or “Tứ Phủ” in Vietnamese, is the traditional art performance of Vietnamese custom that was practiced through decades. 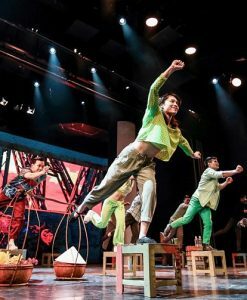 The show now is one of the latest shows in Hanoi that can be added as an evening’s activities for tourists staying in this charming city. In 2017, UNESCO has recognized the mounting the medium as intangible heritage. Also in July, the show was also recognized by TRIPADVISOR as an excellent service of the year. Location: The Worker Theater (Cong Nhan Theater), Address: No 2 Trang Tien Street, Hoan Kiem District, Hanoi. 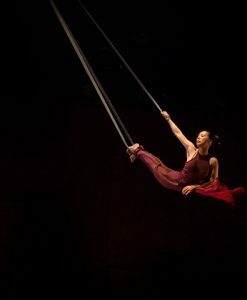 Directed by Viet Tu, a well-known director of Contemporary Theatrics in Vietnam, “Four Palaces Tứ Phủ” is a uniquely creative and artistically inspired work of art. 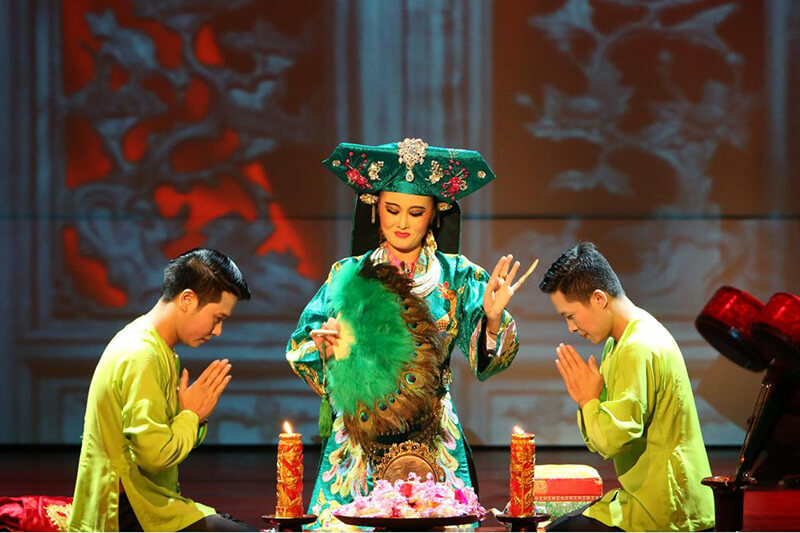 The show is based on folklore materials on the Viet beliefs of the worship of Mother Goddesses over decades. “Four Palaces” simply means the belief in the worship of Four Mother Goddess of Heaven, including Mother Goddess of Heaven, Mother Goddess of Water, Mother Goddess of Forest, Mother Goddess of Earth. 1. 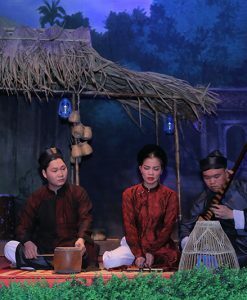 “Four Palace” is considered a medium of lively communication of humans with Gods or Saints, divine beings who are familiar to Vietnamese both spiritually and in real life. The communications are organized as rituals by physics or mediums playing roles of middlemen connecting people to divines. 2. 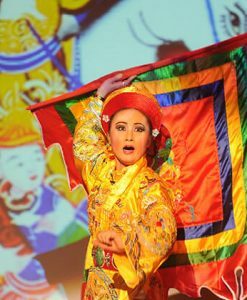 “Four Palaces” collected various materials of folk arts such as “hát chầu văn” or “chầu thánh” – a traditional folk art combining trance singing and dancing, and rites as well as music with folk instruments. 3. 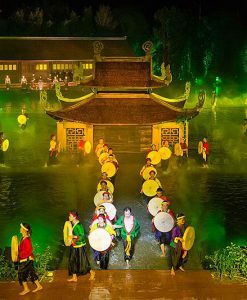 “Tứ Phủ Four Palaces” is highly attractive not only due to the colorful and lively decorations but also by its content aiming to reflect the Vietnamese spiritual life, folk art and culture in Vietnam as well. 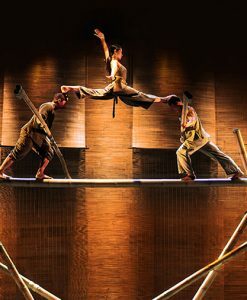 Reconstituted creatively with all the sounds of modern art including video, performance art, and many other stage effects, together with interactivity and hyperspace are cleverly combined, “Four Palaces” is one of the most favored cultural shows for tourism in Hanoi. On December 1st, 2016, the beliefs of Mother Goddesses Worship were inscribed on the representative list of the intangible cultural heritage of Humanity by UNESCO. Unlike others that in need of urgent conversation, the beliefs of Mother Goddesses Worship have experienced long and strong growth in the Viet spiritual culture and have also become more and more popular, displaying itself more than ever in spite of its checkered history. 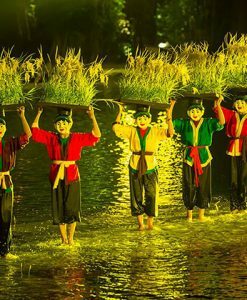 The practices relating to the Viet beliefs in the Mother Goddesses Three or Four Realms, known as “Chầu văn”, “hầu đồng”, “lễ thánh” appear boisterous and lively in temples, pagodas as well as other areas all over the country more than ever. Not only is a form of folk art with a long and tenacious history growth, but it also a belief of people in Mother Goddesses. It is said that Mother Goddess Worship Religion shows hope of controlling the lives of Asian women because they create, give birth, protect and develop the world both in the past and today. 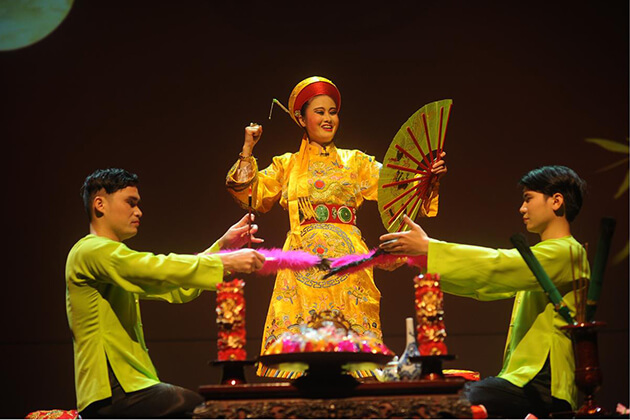 In 45 minutes of the Four Palaces Show, audiences can have a chance to witness the outstanding practiced traditional custom and culture of Vietnamese people’s lives. 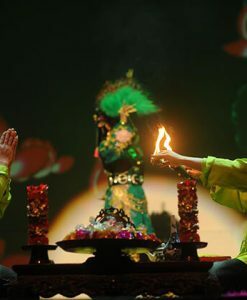 Going into trance is a unique ritual performance of Vietnam practiced over a thousand years, offering tourists a different and unique experience that they never have before. 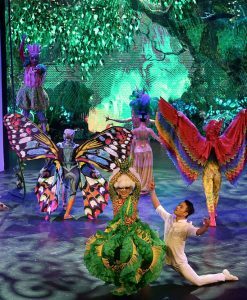 During the session, a number of artistic elements including music, singing, dancing and the use of colorful costumes are involved in through three parts of the show: “Chầu Đệ Nhị”, “Ông Hoàng Mười”, “Cô Bé Thượng Ngàn”. People said that Goddess of Mountains & Forests with green shining costumes, feather fan and light on hand always brings luck and wealth to the people. 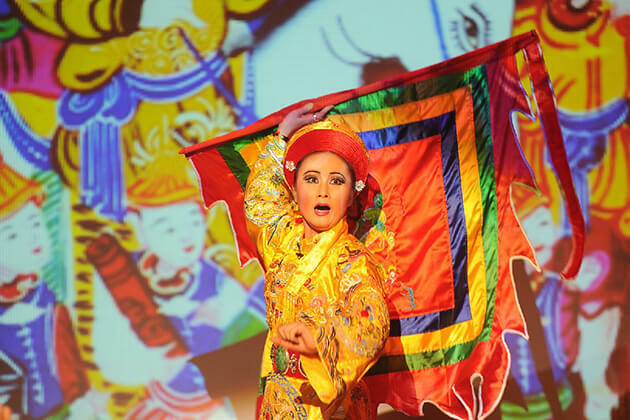 This performance gives the audience an opportunity to witness the actress incarnating Goddess of Mountains and Forests with exact mood and gestures. There is a legend that “Ong Muoi” is the son of King of Ocean. He made a great contribution to defeating the Chinese invaders. After the war, he lived in Nghe An province, then became a God and leave the earth. During his life as a talented warrior, he was well-known for poems, he was always in a yellow long dress and traditional yellow embroidered turban. Enjoy this performance and you will observe his appearance with lots of servants serving him betel, tea, cigarettes while musicians were performing traditional folk music. Once upon a time, the little Princess served the Goddess of Mountains and Forests. She put on brocade, silver necklace, dancing with an umbrella and baskets of flowers. 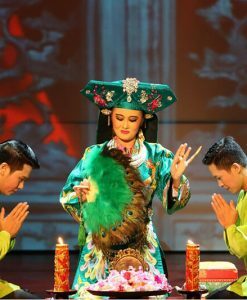 The performance of the little Princess not only healed sick and bring luck to the people by offering flowers and gifts to them. If you are lucky, you can have a small lucky gift from her. 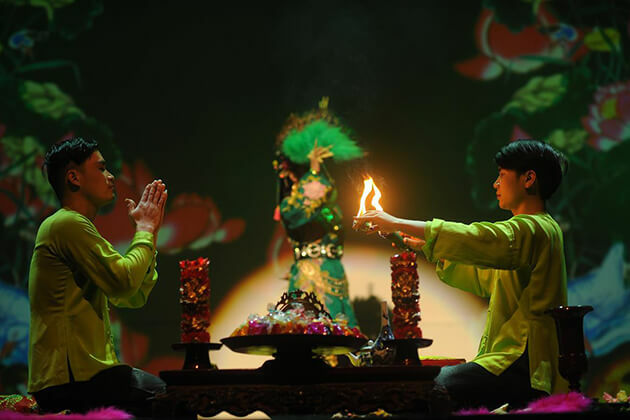 For short, it would be amiss if discovering Vietnamese culture without its rich tradition of spiritual belief, and The Four Palaces Show brings the fullest taste of this religious performance.